“One day you will write your own book, just let your heart guide you”. Those were the immortalised words of my teacher in the 5th Year of Primary School; I was 8 at the time. I’d just had a short story published in the school magazine, and won a prize of a book for my privilege. I knew I had wanted to write since I could write sentences. 28 years later I am realising that dream. I am Kristina Jackson; I am in my mid thirties, wife, mother of two, owner of one dog and slave to two cats. One of my cats, Bono, is my writing companion, he is often found sharing my lap with my laptop or partially draped over the keyboard if I am using the desk. I suffer from a condition called POTS (postural orthostatic tachycardia syndrome) I have become disabled by it, but as physical doors have shut the mental ones opened. Now I have so many ideas, the ideas are throwing out so many characters they are threatening to run away with my remaining sanity. It is anybody’s guess where this will now lead. 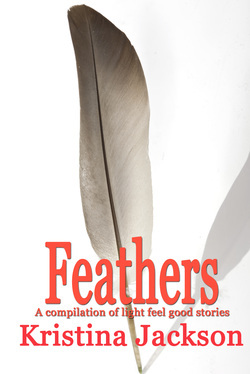 Feathers, an anthology of 5 light feel good, short stories, with a strong message of making the most of life, despite adversity. There are some with a little light romance some are even amusing. At the feet of a god – whose feet does Shannon fall at, and where does it lead her? Spinning wheels are just for spinning – Does anyone still believe in Fairy Tales? The sands of time – Does Charlotte manage to retrieve her life from the sands of time? With endings come beginnings – When Graces world falls around her ears, can she strike out and find that beginning? Ivan – What is in the parcel he receives on Christmas Day and where does it take him?